I now have necklaces in my shop! These aren't just simple guitar pick necklaces, these are chandelier style...which to some looks like armor. I think of music as armor, or this is perfect. I've made and have had guitar pick necklaces available in the past, but they were too simple to me and didn't seem that unique. But these I love and am proud to make them available! • "Flames" Guitar Pick Necklace - Yellow, orange and red picks with a sparkly hand made pick at the end. Charm features a yellow music note with a medium length leather cord. • Pink & Purple Guitar Pick Necklace - Purple, Pink and Mauve picks with a sparkly hand made pick at the end. Charm features a Fuchsia music note with a long black chain. 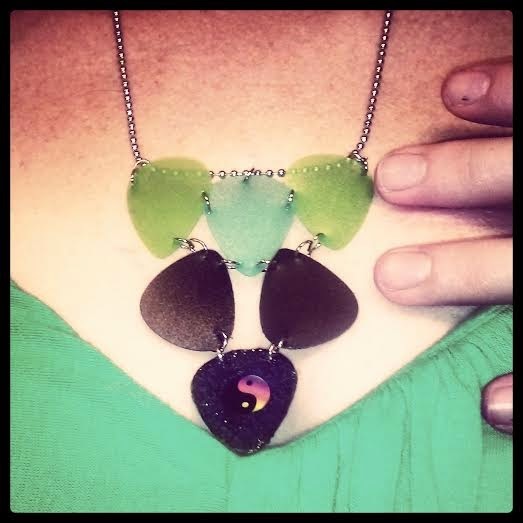 • Green & Teal Guitar Pick Necklace - Green and Teal picks with a sparkly hand made pick at the end. Charm features a Green music note with a long metal chain. • Blue Guitar Pick Necklace - Blue picks with a sparkly hand made pick at the end. Charm features Psychedelic Waves pattern with a Gold music note with a medium length leather cord. All necklaces are reversible! They have a different design on each side! Here's a photo of the first one I made and ended up quickly selling. I was so flattered and surprised! I can make a guitar pick necklace just like this but in custom colors and with a different and unique pendant. Just fill out the custom order form!